Residents of Flint, Michigan, understand better than anyone the profound connection between water and health. Months after the city reversed its decision to source its water from the polluted Flint River, dangerous levels of lead continue to leach from corroded pipes into drinking water. Today, residents of the city depend on cases of bottled water trucked in and distributed by the National Guard and charity groups. As any public health student knows, water is central to the field’s genesis story, going back to John Snow’s pioneering work to identify a single contaminated well as the source of an 1854 cholera outbreak. 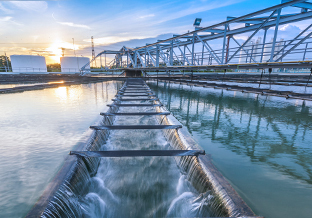 In subsequent decades, cities invested in water infrastructure, which combined with later refinements like chlorine purification, are credited with major gains in life expectancy beginning in the first half of the 20th century. Americans take water purity and safety for granted. It takes a crisis like Flint to show how vulnerable the water system is to neglect and bad decisions by unthinking politicians. Of course, Flint isn’t an isolated case: cities across the country are saddled with aged water systems—including an estimated six million miles of lead pipes. A decade ago, lead leached into the water in Washington, DC, more than doubling the number of young children with lead poisoning. Just this past Wednesday, officials in Newark, New Jersey, shut off water fountains at 30 school buildings after tests indicated elevated levels of lead. “In Flint, and elsewhere, we now see children poisoned by the very water system that once helped us wipe out cholera and typhoid as endemic diseases,” says Rosner. In developing countries, the availability of clean water is even more precarious. The United Nations estimates that there are 1.2 billion people without access to safe drinking water worldwide. Rapid urbanization has exacerbated the problem, creating sprawling informal settlements without any water systems. Building robust water systems in remote rural areas or booming cities is often out of reach for developing countries, as many areas are forced to contend with lack of funding, dysfunctional governance, and civil strife. Last summer, 15 Mailman students worked in the Democratic Republic of Congo, assessing resiliency of communities after a disruption took place, and another group of students will return next summer to carry out the work. Water is one of their key measures. “There are four or five universal markers of resilience in a society, and water is one of them,” says Roberts. 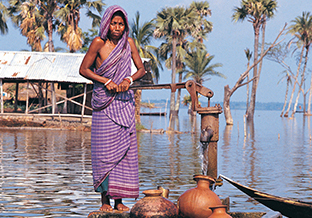 In the 1970s, international aid agencies built 10 million shallow tube wells in Bangladesh in an attempt to reduce cases of water-borne diseases. While the new wells reduced exposure to the microbes causing such diseases, they also yielded water contaminated with arsenic, which occurs naturally in the region. Over the past two decades, research by Environmental Health Sciences Professor Joseph Graziano and colleagues has uncovered the public health consequences of this exposure to arsenic. Graziano and colleagues found exposure to contaminated wells raised the risk of cognitive deficits in children, as well as death from heart disease and other chronic diseases in adults. In all, 77 million Bangladeshis were exposed and as many as one in five deaths in the country can be traced to the exposure. And Bangladesh is far from alone: some 70 countries have arsenic-contaminated wells, including the United States. In fact, arsenic is this country’s single biggest water-related public-health problem, according to Graziano. In eastern New England, 20 percent of private wells are contaminated. In Maine alone, 80,000 people are affected. A study he led there found arsenic levels, even at extremely low levels, were enough to lower children’s IQ. “We’re hoping that recognition of the potential consequences for children may be a turning point in getting more action,” says Graziano. New Jersey, one of the only states to have any regulations regarding arsenic, has already lowered its limit from 10 parts per billion, the federal standard, to 5 parts per billion. Meanwhile in Michigan, thousands of Flint children face the possibility of irreversible brain damage from drinking lead-tainted tap water, along with a range of other health problems like skin rashes and stomach ailments.